Not very long ago if one were to suggest exploring Katowice by Bike one might have questioned your sanity. 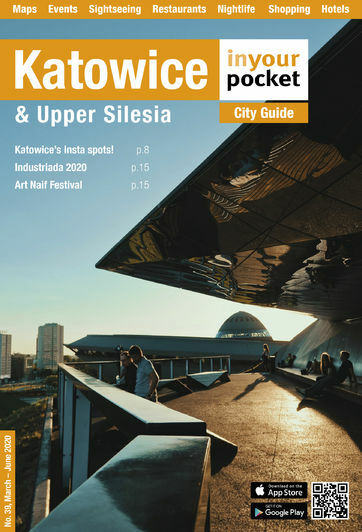 Those days are long gone however and after years of recent infrastructure improvements and new investments in world class architecture, greater Katowice is an exciting and exceedingly eclectic destination to discover on two wheels. Follow IYP as we show you around some of the best spots and give you some survival tips for getting the most out of a bike day trip in Katowice. Our grand adventure began outside the centrally located angelo Hotel where Silesiatrip.pl have one of their rental bike pickup points. You can rent a bike right at the Hotel reception and return whenever you’re done. Silesiatrip.pl also have bike pickup points at other Hotels in the city or you can arrange for a rental bike pickup from their ul. Mariacki headquarters. Alternatively you can pick up a rental bike from one of the dozen or so City By Bike rental stations scattered around the city/region. Starting from the angelo Hotel we set a course for Silesia Park. Using the two-page Katowice City Map from the back of the guide (ps. 84-85) we planned our course from Sokolska Street to the park. We rolled North and crossed the upper part of the four lane highway that makes up Chorzowska Ave on foot. We made our way to the bike path that parallels the tram lines that head Northwest towards Chorzów. The bike path is shared with a pedestrian path but well-marked. It was smooth sailing all the way to Silesia City Center when the signs clearly mark that bikes should head under a pedestrian tunnel to the left side of the highway. Perhaps we misunderstood the signage but we followed suit only to find ourselves in a parking lot of a car dealership on the other side with no further bike signage in site. Force of habit drew us to the sidewalk with no clear bike lane. We awkwardly continued to make our way Northwest again, this time with oncoming traffic rushing towards us on Chorzowska. Once we passed the Silesia City Center we could see construction where the bike lane on the opposing side would be. Upon further inspection it seems the bike/pedestrian path on the North side of Chorzowska Ave is currently undergoing maintenance. Keep this in mind as it may be open again in the near future. Nevertheless, we continued our journey onward and finally crossed back over to the North side at the Southernmost tip of Silesia Park where Chorzowska Ave intersects Złota Street. There isn’t actually a direct entrance to the park here as it is the entrance to the Silesian Amusement Park. So we followed a pedestrian path North along Złota Street and finally entered the giant park on a marked path just after the Gondola/Ski lift entrance. We sped through the park and enjoyed the two wheeled freedom to explore Silesia Park's vast natural beauty and many attractions at our own pace.The first thing that caught our eye was the gorgeous Rosarium which was in the process of being pruned by a team of gardeners. We weaved in and out of rows of bushes and beds filled with all shapes and sizes of colorful roses. We were highly fortunate to have embarked on our Silesian cycling trip on a gorgeous early Summer day. We continued on lazily winding our way through the many pedestrian pathways of the park and quickly arrived to the Kontener Cooltury (p. 58). This pleasure island of tranquility comes alive during the weekend when it hosts a hugely popular concert as well as plenty of burgers, beers and basking in the Silesian sun. Nothing was on at the moment so we sped Northwestward past the central pond and took a turn North to hunt down the Silesian Sculpture Garden. The route took us uphill and we had to avoid some fallen limbs on the pedestrian trails as a storm had passed through earlier in the day. Once we finally found the Sculpture Garden we took a short break to admire the beautiful and sometimes oddball sculptures sunken deep into the forest and fields of the Northern stretches of the park. For more ambitious riders there is an official cycle route which is clearly marked and circumnavigates most of the park on well-marked and well-paved roads. We came close to bisecting this path but being the amateur enthusiasts that we are, we avoided taking this route entirely and decided instead to double back and head for some refreshments. We sped happily downhill through more felled brush and some other back trails and ended up near the entrance to the Zoo. It was here we saw the familiar green sign of the Rebel Garden and chose its lovely summer garden to plan the next phase of our adventure. Rebel Garden is a bar, pub and somewhat of a cult favourite that regularly holds open air concerts on their back deck and in front of the gilded gates of the Zoo. We grabbed a local Silesian beverage, took a load off and opened up our trusty IYP map to plan our next move. We were torn between heading due South to the Valley of Three Ponds (where the Off Festival is held) or due East to cruise around Nikoszowiec. Both destinations have their pros and cons but the lateness of the hour dictated that Nikoszowiec was the safest option as it looked to be pretty much a bee line from Silesia Park and we had to be back in the city centre before nightfall. So we packed up and jetted out of the park the same way we came in. We contemplated taking an alternate route back to the city centre but after taking a slight detour through some side streets we made our way back to Chorzowska Ave and followed the same route back Southeast. This time however we sped past Sokolska Street on the bike path and headed straight for the Spodek. The great infrastructure redevelopment of the city centre also saw extensive bike paths built including a ramp that allows cyclists to ascend the eye of the city (formerly known as Oko Miasto, now as Królestwa), which offers the best panoramic views of the new and improved downtown skyline. We paused for a few seconds to take some Kato glamour shots and then continued on our way weaving through the city’s newest architectural marvels. We whizzed by the Spodek and past the new International Convention Center with its angular grass roof terracing and then headed straight for the pedestrian/bike bridge that crosses over to NOSPR. The glorious brick building and the surrounding squares have been so deftly designed that there is ample space for an outdoor restaurant, a gaggle of gawking tourists, several sly fountains and speeding cyclists, without any collisions. We resisted the urge to grab a bite at Cadenza and instead continued on our way. In front of the new Silesian Museum we were faced with a choice of whether to cross over Aleja Walentego Roźdzeńskiego (aka Chorzowska Ave on the West side of Królestwa). It appears that there is a bike path on both sides of the Aleja (Avenue) however looking at the map we assumed at some point we would have to turn right to head towards Nikoszowiec so we chose to cross over the pedestrian bridge to the South of the Avenue and continue Eastward. We were cruising smoothly when all of a sudden the bike path seemed to disappear just North of the Novotel. Since cycling on the busy 3-lane Avenue was totally out of the question on our rented city bike, we started to use our cyclist’s intuition and went a bit freestyle. We headed South for a block until we found another cyclist who seemed to be heading in the same direction, so we followed him. He led us to an amazing secluded canal (see picture) that had two paths on either side both heading due East. We couldn’t believe our luck and without thinking we sped off down the canal. We ducked under branches and admired the shady park tucked under the noisy Avenue above when all of a sudden the path ended abruptly in thick brush. We could see across the canal that the path also ended but there was an outlet to the street. We were forced to double back to the last overpass we had just gone under. The overpass turned out to be Bogucicka Street and it led us South to the May 1st Boulevard (1 Maja) where we were once again reunited with an official bike lane. Once we were on May 1st it was pretty much smooth sailing biking due East. There is a fairly well marked Bike path that goes straight to Nikoszowiec and avoids the many overpasses and underpasses of the Silesian highway system. Keep your wits about you and in about 20 minutes you can make it to the first stop for any trip to Nikoszowiec, the Wilson Shaft Gallery. We took a quick peak into the giant gallery which is currently hosting the Art Naif Festival through mid August and then remounted and headed for the heart of the bucolic workers district. In under 5 minutes we were parked up under St. Anne’s Church flashbulbs flying. We circumnavigated the whole of the district several times although from the look on the locals faces, they have yet to see many renegade tourist bikers in these parts. We grabbed another refreshing drink at Riksza Pub, our favourite Nikoszowiec haunt. We noticed the sun was beginning to set so we saddled up one last time for the return journey. We took the exact same route to get back to the city center although this time we kept following the May 1st boulevard until it turned into Warszawska Street and then we followed Warszawska until the start of ul. Mariacka. 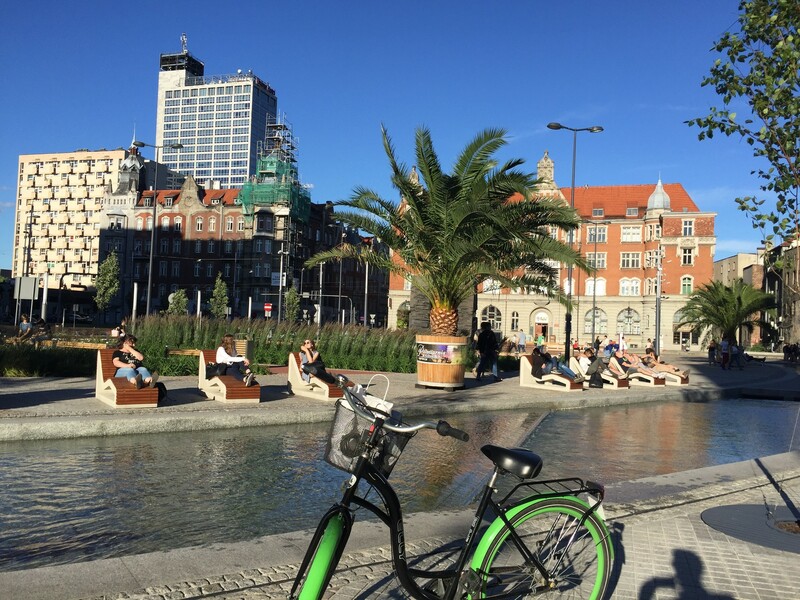 We did a quick buzz of the pedestrian thoroughfare from East to West to take in the sights of the gathering crowds of early summer revellers and then bee-lined it for the Rynek to see if all the new construction had made it more bike friendly. 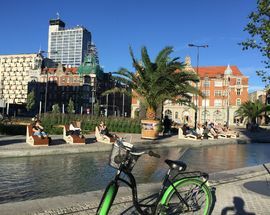 Much to our delight, the wide open spaces and open design of the new Rynek is not only bike friendly but the palm trees, beach loungers and flowing river mean it’s also sunbather friendly! We took our last photo as the sun dropped lower on the horizon before we made our way back to the angelo Hotel to return our noble green steed. We had a great day exploring some of the best hidden spots the city has to offer and were generally impressed with the cycling infrastructure Katowice has in place and which only looks to increase in the near future. While we certainly encourage you to take the same routes as us (and definitely rent a mean green Silesiatrip.pl bike), greater Silesia is filled with even more amazing architecture, an abundance of parks and plenty of post industrial curiosities well worth exploring on two wheels.